Looking to the future also means remembering the past. “I never think of the future. It comes soon enough.” Albert Einstein's words said on an early trip to the United States, not long after his Theory of Relativity was proven, were simple and elegant, much like his theory. In only 100 years, the gasoline-powered car has risen to dominance, changing the world of mobility forever. And it’s rapidly changing again. There were two words we constantly heard at Geneva last week: connectivity and mobility. For many driving enthusiasts those aren’t very good words. How come? Because they’re identified with self-driving cars, hybrids, EVs, and anything else that could potentially take the fun out of driving. But after speaking with Henrik Wenders, BMW i’s Vice President of Product Management, we’re more convinced than ever the German automaker has everyone’s best interests in mind, from enthusiasts to environmentalists, and those who desire anything and everything high-tech and state-of-the-art. Bear in mind that Wenders’ previous position was product chief for the i8. Point being, he’s got street cred. We conducted our interview in, conveniently, an i3, which has been a solid success, especially in the US where buyers often have a "why not" attitude. According to Wenders, "they’re more open than Europeans to trying something new." And despite issues such as range anxiety, more than 60% of i3 owners are not using the gasoline range extender engine; they’re getting by on pure electric power only. By the end of this year, Wenders proudly pointed out, the i3 will come with a new battery pack that’ll have 50% more range than before. But the i3 represents much more than range abilities. BMW i wants a global leadership role in sustainability. Take carbon fiber, for example. BMW made the big decision to invest in carbon fiber production, as opposed to buying from a supplier only. 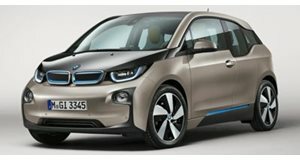 Problem was, a facility didn’t exist that could produce the amount of carbon fiber BMW required for the i3 as well as the i8. What to do? With SGL Automotive Carbon Fibers, it invested $300 million in a joint facility in Washington state. This industrialization of carbon fiber required a continuous power supply, but wind and solar were not options. What was? Hydropower. The BMW i program was "developed on a white sheet of paper," Wenders explained, and reducing the overall carbon footprint was considered a must from the get-go. At this point during our talk, Mr. Wenders noticed I was admiring the i3’s interior. For example, "KENAF fibres", a sustainable member of the cotton family, are used throughout the interior. Eucalyptus wood, responsibly grown in Europe, adorns the dash. Aside from sustainability, BMW knows its customers also want a connected life. "Think CES" (the annual Consumer Electronics Show held in Las Vegas) as a good example. But the question enthusiasts want to know is how this, sustainability as well as connected technologies, will affect their driving passion? That’s where the i8 comes into play. Mr. Wenders wholeheartedly confirmed my view of the i8 as being a blueprint as to how sports cars of the future will be like, in terms of powertrain, materials, and performance capabilities. 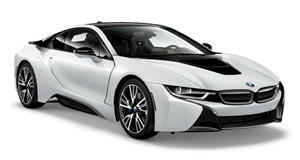 Anyone who’s ever driven an i8 can attest to its Ultimate Driving Machine pedigree. Mobility technologies are evolving faster than ever, but it’s automakers like BMW who are leading the way forward. At the same time, however, BMW is not forgetting the loyal customers who embraced the Ultimate Driving Machine. Looking to the future also means remembering the past.